It’s time for Secret Recipe Club, November version – and a blog that I had a tough time picking a recipe from! Love and Flour has a ton of great ones. After debating between several, I settled on this, which was a great (and EASY!) dessert after a comforting dinner. Not the easiest dish to get a decent photograph of, but take my word for it…you should make this. I could have fit more apples in my crockpot…obviously it depends on the size of yours…definitely a great option when feeding a group. The house smelled delicious, too…even though I busted a few of them up…oops! Don’t forget to check out the other delicious creations from everyone participating in SRC this month! Hollow out each apple, making sure bottom stays intact. Combine cranberries, sugar, nuts, and spices in a bowl. Stuff each apple with mixture. 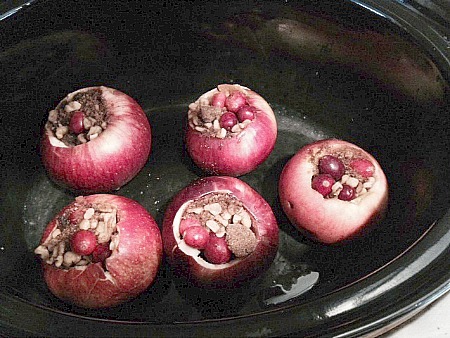 Place apples in crockpot and cook on low for about 4 hours. Serve with ice cream or whipped cream if desired. 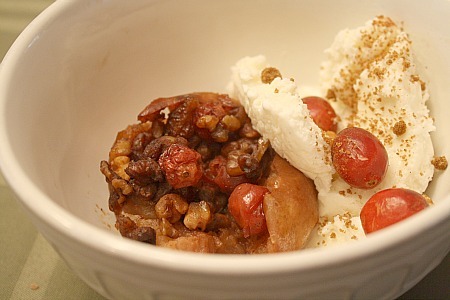 This entry was posted in berries, crockpot, dessert, fruit, make ahead, nuts, Secret Recipe Club. Bookmark the permalink. Yum, those apples look crammed with sugar, spice, and everything nice. This dish sings out Autumn! I can almost smell the aroma from here – yummy. Yum- I love spiced apples! They look amazing! Can you send one or two over? It is gray and cold outside and I don’t own a crock pot…. At first I thought those were grapes in there, but cranberries sound even better. Yummy! How good is the smell of baked apples in the air! The cranberries are a really interesting idea– I’ve certainly mixed apples and cranberries in things like crisps, but it would have never occurred to me to stuff them in baked apples. Great choice! Glad you liked them Melissa!